Step(1):--- Right click on my computer icon--> click open . step(2):--- Right click on Organize . Step(3):----- Double click on Folder and Search Options . Step(4):--- Then click On View . 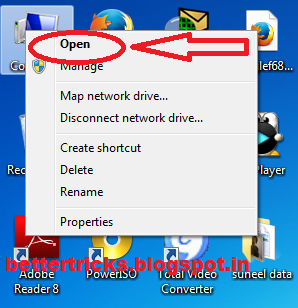 Step(5):---Then Click onShow hidden Files,Folders or Drives . Step(6):--- then click on Apply and Then Ok.